A file folder and pair of scissors is all you need!. Photo © 2006 Lianne McLeod, Licensed to About.com, Inc.
Hamsters (and many other small pets) love cardboard tubes. You can give them the inner rolls from toilet paper, paper towels, wrapping paper and other rolls, but some have concerns over the glues and adhesives on these items. You can also buy sturdy cardboard rolls marketed just for pets (Totaly Chewbular Play Tubes, Chubes, Critter Caves, etc.). These are wonderful products, but if you want to save money or need toy for a bored hamster quickly, why not try this idea? I originally spotted the tip on the Twin Squeaks Gerbils site and was inspired to try it out, and it works wonderfully! This project will take just a few minutes and provides easy entertainment for your pets! 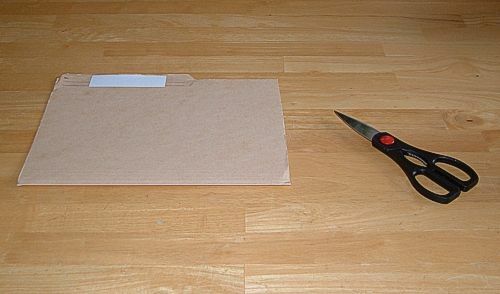 All you need to get started is a file folder and a pair of scissors. To be safe, use file folders that are plain brown -- not colored. Cut the file folder into desired sizes. Photo © 2006 Lianne McLeod, Licensed to About.com, Inc.
First, cut the file folder along its natural fold line. You can also tim off the tab portion if desired. Depending on the sizes of play tubes you wish to make, you can cut each half folder into smaller sizes. Now I can make one large play tube and two smaller ones. Photo © 2006 Lianne McLeod, Licensed to About.com, Inc. In this example, one half of the folder was kept whole to make one larger tube and one half was cut again to make two smaller tubes. You can experiment with different cuts to make different sizes. As you can see, a single folder gives you lots of material for multiple homemade play tubes for your hamster. Rolling a piece of folder tightly around a pencil. Photo © 2006 Lianne McLeod, Licensed to About.com, Inc.
Now all you need to do is roll up your pieces of file folder to make play tubes. Here, I am making a tightly rolled tube by rolling a smaller piece of file folder around a pencil. Once you have rolled the folder, simply hold the roll in place for a few seconds; when you let it go it will uncoil slightly but retain the shape of a tube. Ready for play: a small file folder play tube. Photo © 2006 Lianne McLeod, Licensed to About.com, Inc.
Once the tube uncoils a bit, you can adjust the final diameter by loosening the rolls a bit if desired. This is what the roll looked like after rolling it on the pencil. I then just unrolled it a bit to loosen it a bit, to get the diameter I wanted for a small homemade play tube (the end result can be viewed at the end of this tutorial). Experiment with different rolls and adjustment for variations on a play tube. Photo © 2006 Lianne McLeod, Licensed to About.com, Inc. This was the result of my second small roll -- as I loosened up this one after rolling it one a pencil I ended up with a tiny tube inside another tube. As you experiment with different methods of rolling and adjusting you can come with your own variations! A looser roll will make a larger diameter play tube. Photo © 2006 Lianne McLeod, Licensed to About.com, Inc. Here I have rolled the larger piece of file folder (the half folder size) in a looser roll. After holding for a few seconds, it will hold its shape as a larger homemade play tube quite well. The larger diameter play tube made from half a file folder. Photo © 2006 Lianne McLeod, Licensed to About.com, Inc. This is the larger homemade play tube I made with a half file folder and a looser roll. One of the smaller rolls is visible in the upper right for comparison. These tubes hold their shape remarkably well -- probably longer than it will take your hamster to destroy them! If not, a little squeeze can restore their shape as a play tube. Three homemade play tubes, made from a single file folder. Photo © 2006 Lianne McLeod, Licensed to About.com, Inc. Here are the three homemade play tubes I made from a single file folder. As I mentioned before, they hold their shape well. You can have fun experimenting with different sizes, shapes, and rolling styles to provide your hamster with a wonderful variety of play tubes. Your hamster can play in them if they are larger, or just chew on them if they are smaller. There is little doubt your hamster will be able to destroy these play tubes pretty fast. However, if you consider the cost of of file folders (where I live I pay under 10 cents per folder by buying a box of 100) and the fact that you can make multiple tubes from each folder, the cost of each play tube is very small indeed. So these homemade play tubes are very inexpensive, safe (remember, stick with plain - not colored - folders), and best of all, lots of fun! Have fun making homemade play tubes for your hamster, and let your imagination go wild! How Do I Determine if My Hamster is Male or Female? What Cage is Best for a Dwarf Hamster?